Debra was one of the fabulous bloggers I met over the summer at the Potluck. Her blog, SmithBites, was one of my summer finds. Through our twittersations, I learned that not only is Deb the life of the party but she has a heart (and I’m guessing a house) big enough to love an entire clowder of cats. Yes, I did have to turn to my good friend Google for that term. Thank you very much, now we’ve all learned something today. Her food memory originally appeared on her site, which just happens to have the tag line “Food That Connects Us”. I had emailed her about participating in the Food Memories project and when she offered this story, the story of the first dish that her future husband ever made her, I couldn’t type out my thanks fast enough. It also came to my attention that Debra has special ninja powers protecting her posts. The details of that discovery aren’t pertinent to anything other than I think having ninja powers is pretty cool. There is a running joke in the family that The Professor and I never dated . . . and we didn’t . . . even though we spent quite a bit of time together, it was never, ever called ‘a date’. Once we decided we were getting married, the wedding took place within 10 days – yes, you read that correctly, 10 days and it was quite lovely. But the first meal The Professor ever cooked for me (on a ‘non-date’ night of course) is still one of my all-time favorites and always takes me back to that house on 38th Street, the galley kitchen and the cute little dining room with hardwood floors. Black Beans & Rice, packaged salad mix, non-fat bottled Italian dressing, a roll with ‘lite’ butter and non-fat ice cream for dessert; he was eating a low-fat, vegetarian diet and I was eating a full-on fat, lots-of-meat diet. It gives us both a good laugh whenever we talk about it but he cooked for me people, and he was wooing me even if he didn’t realize it. I moved into that house after we were married and together we created a home. There were a multitude of meals made in that kitchen – some triumphs and some major fails . . . uhm, like the dish created by The Professor which included barbecue sauce and dried chickpeas that hadn’t been soaked . . . but hey, I count myself lucky – his mother reports that, as a young boy, he used her blender to grind up worms, seeds and heaven-knows-what to feed a baby bird he had found. And that’s exactly what I love about The Professor, he’s fearless when it comes to trying new things! But there were also some terrific meals prepared in that kitchen as well; things like Crab Cakes with Red Pepper Remoulade, Hummingbird Cake, Strawberry Angel Food Cake, Pork Chops with Sour Cream Horseradish Sauce, coconut cream pies, strawberry jams and Spaghetti. We had wonderful gatherings and parties in that house too: Grandma’s 80th birthday party, Mother’s Day Brunches, a sister-in-law’s birthday that involved a ‘Jenny Gymnast’ doll (get Cheryl going and it’s laughter so hard that tears stream and you find yourself wishing you’d worn Depends), Easter suppers and a Thanksgiving meal for 15 where we were packed so tight in that dining room, that if anyone needed a potty break, everyone had to stand up to let you pass. Happy sigh . . . such wonderful, wonderful memories and ones that I will always cherish. I’m still a meat-eater but much, much less these days; The Professor now eats meat as well and I’ve recruited him over to the dark side of full-fat, real food (using less) rather than a bunch of artificial and chemically altered fats. Our palettes are always eager to explore the culture and world around us. Oysters, duck, bison and vegetables like ramp, patty-pan zucchini, kale or tomatillos and even some of the old standards like meatloaf or pot roast have been given a unique twist using a few new ingredients or techniques. And 12 years later, he still cooks for me. What food memories do you have about dating or ‘non-dating’ whether it’s one you cooked or ate at a restaurant? BAH Note: I’ve never been a beans and rice gal but I really enjoyed this dish. I may have added a few items that weren’t authentic to what The Professor served Debra that night but when I told her about adding cubed turkey and sliced avocado, she was all in favor of my decision. Heat the oil in a nonstick frying pan over medium heat and saute the onions and garlic until the onions are soft. Add the rice and season to taste with salt and pepper. Cook for about 5 minutes, until the rice is heated, and add the beans and cumin (if using). Cook for another 3 to 5 minutes until everything is heated through, adjust seasoning, and serve garnished with green onions or cilantro. You are so right about both Deb’s huge heart, vivacious personality and her mad ninja skills. I love this post about her and the professor, I’ve never read it before. Yummy recipe! The stories behind these Food Memories are as much of a treat as the recipes. And Deb is peach isn’t she? When I was single and teaching, I’d make a big pot of red beans and rice and eat on it all week…ah, the life. Kitch, would you believe this was really my first bb&r experience? This version was super freaking quick and easy…great for a weeknight. 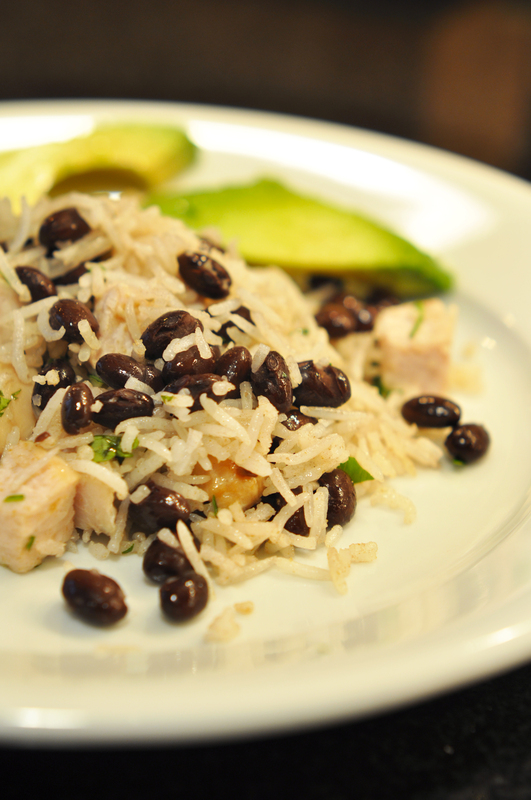 And now if you make black beans and rice it’s because you want to instead of have to. Maria, thanks for stopping by. I hear The Professor went to SanFran with Debra for BlogHer Food. So sad not to have been there and met him. Deb is so much fun! I love her Professor stories. My first food memory with my now-husband was on our second date. He invited me to his house and he made dinner – a chicken pot pie. It was made with store-bought dough and gravy in a can, but come on, a pot pie! And he made it!! Unfortunately, it was loaded with broccoli which at the time I hadn’t quite made peace with. To me, the whole dish tasted like broccoli and broccoli only. But I like broccoli now, and obviously I like him, so maybe that dish started it all. Jennifer, perhaps Deb could start a blog feature of The Professor stories! I can not even begin to describe the one and only dinner my Mistah tried to make for me while we were dating. It was a hot mess. Glad that your husband got you to embrace the broccoli (and yes, as I type that I am singing “Chopping Broccoli”). oh how i love a good woo story! i don’t lurve me some beans&rice, but when done right it’s quite the treat. and well, you know about the time i made mexican lasagna and that boy who refused to have a bite of it. oh the anger i still feel! i should’ve kicked him in the crotch and to the curb permanently. Life & Kitchen Lessons, yes? Lan, I love men who can cook. Can someone please tell me if there’s a cooking bootcamp I can send mine to? As Fr. Leo would say, angry much? Such a sweet story! The worm concoction part is hilarious. I would have had to rinse that blender out with boiling water at least a dozen times. Ali, that worm concoction was definitely for a specific audience….I don’t even want to think about that clean up though. I love this story! When we were still dating, my husband used to make me Thai green curry. Except that it was so spicy it was pretty much inedible–instead of using 2-3 TBS, he would put in the entire can of green curry paste. Yikes! It took me a while (read: a couple years) to convince him there was a better way to make green curry. Jenna, the things our men did to impress us. Despite the good intentions, sometimes they just fell apart didn’t they. Hope your fella has seen the light about the green curry paste. Ha! Wendi, I love the “clowder” of cats. I got stuck on that word, wondering what in the world clowder means. I decided it must just be me, that everyone knows what clowder means. I was about to look it up, then I read your next sentence. Very funny! Anyway, SmithBites, that’s a lovely memory. The food you had on your first date takes me back to the low-fat craze of the 90s. Also, grinding worms in a blender, now that’s an image. My date memory: when I first met my husband, I went over to his house for dinner…and found him cutting tomatoes with a butter knife on a cermaic plate! I’m appalled all over again just thinking about it. We still laugh about that one. Jen, you are too funny thinking that I’m some vocabulary ninja master. But yes, wasn’t that a lovely memory. And if you’re looking for a quick and easy meal, that recipe isn’t too shabby either. Please tell me how you educated Kenny that butter knives and plates are not appropriate cutting materials. Have I mentioned the time The Mistah used a box grater to zest a lemon? Not good times. just wanted to let you know you were featured on FoodPress.com today – thanks for a great post! Jane, I’m thrilled that this post was picked for FoodPress. There is actually a special place in my heart for Chipotle and their carnitas and rice. But that will be our secret, right? Too funny & what a lovely story. Aint love grand huh. Anna, love is something all right. Does it matter what kind of rice? Tina, it doesn’t matter one bit what kind of rice. I *may* have used a bag of Uncle Ben’s microwave rice. Tina, you can fancy this up with whatever you happen to have in the pantry. For real, it does not get much quicker or easier than this.